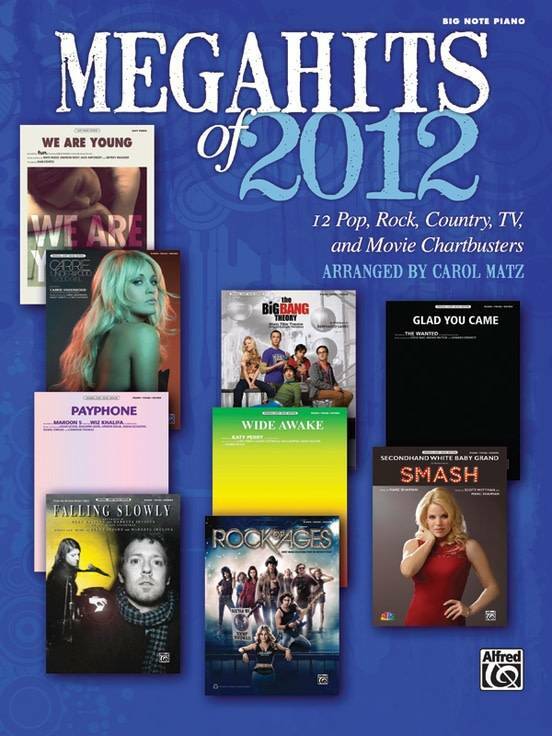 From the official music publisher of thousands of popular artists, songwriters, and composers, the Megahits of 2012, piano songbooks include a variety of arrangements of this year’s pop, rock, and country song favorites. From the official music publisher of thousands of popular artists, songwriters, and composers, the Megahits of 2012, piano songbooks include a variety of arrangements of this year’s pop, rock, and country song favorites. With editions for beginning and experienced pianists, players of any level have the opportunity to learn their favorite songs from some of this year’s top artists. Features the main title theme from The Big Bang Theory, "Boyfriend" (Justin Bieber), "Glad You Came" (The Wanted), "Payphone" (Maroon 5), "We Are Young" (fun. ), Good Girl (Carrie Underwood), Don't Stop Believin' (The Rock of Ages), Everybody Talks (Neon Trees), Falling Slowly (from Once: A New Musical), Tongue Tied (Grouplove), Wide Awake (Katy Perry), and Secondhand White Baby Grand (from SMASH).